The Rorschach technique, sometimes known as the Rorschach test or the inkblot test, is a projective personality assessment based on the test taker's reactions to a series of 10 inkblot pictures. The Rorschach technique is the most widely used projective psychological test. The Rorschach is used to help assess personality structure and identify emotional problems and mental disorders. Like other projective techniques, it is based on the principle that subjects viewing neutral, ambiguous stimuli will project their own personalities onto them, thereby revealing a variety of unconscious conflicts and motivations. Administered to both adolescents and adults, the Rorschach can also be used with children as young as three years old, although the commonly used Exner scoring system (discussed below) is appropriate only for test taker five years or older. The Rorschach technique is used to elicit information about the structure and dynamics of an individual's personality functioning. The test provides information about a person's thought processes, perceptions, motivations, and attitude toward his or her environment, and it can detect internal and external pressures and conflicts as well as illogical or psychotic thought patterns. The Rorschach technique can also be used for specific diagnostic purposes. Some scoring methods for the Rorschach elicit information on symptoms related to depression, schizophrenia , and anxiety disorders. Also, the test can be used to screen for coping deficits related to developmental problems in children and adolescents. The Rorschach is generally used as part of a battery of tests and must be administered by a trained psychologist . Also, scoring the Rorschach test requires training in and knowledge of a comprehensive scoring system. There is some disagreement concerning the reliability, validity, and clinical utility of the test and its scoring systems. Diagnoses for clinical disorders should not generally be based solely on the Rorschach test. The Rorschach technique is named for its developer, Swiss psychiatrist Hermann Rorschach (1884-1922). 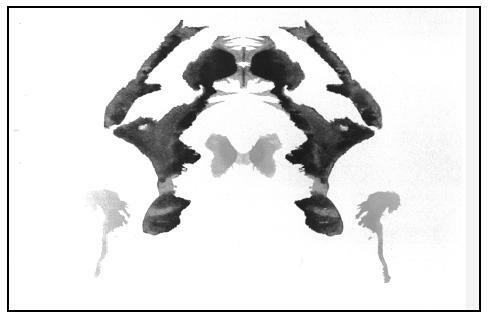 Rorschach, whose primary interest was in the psychoanalytic work of Carl Jung, began experimenting with inkblots as early as 1911 as a means of assessing introversion and extroversion. The Rorschach technique is administered using 10 cards, each containing a complicated inkblot pattern, five in black and gray, two in black and red, and three in various pastel colors. Subjects look at the cards one at a time and describe what each inkblot resembles. They are instructed to look at the shape, shading, and color of the inkblots. After the subject has viewed all 10 cards, the examiner usually goes back over the responses for additional information. The subject may be asked to clarify some responses or to describe which features of each inkblot prompted the responses. Actually, there is no one correct response to any inkblot card, although there are certain common responses to some cards. Example of a Rorschach inkblot test. will be non-directive, indicating it is the test taker's choice. A response like this from the test administrator is consistent with the projective nature of the Rorschach technique in that the test taker is projecting his or her personality onto the test stimuli. Rorschach, who pioneered the test in 1921, did not provide a comprehensive scoring system. In response to complaints about validity, scoring methods have been devised that aim at providing greater objectivity by clearly specifying certain personality variables and relating them to clinical diagnoses. Originally published in the 1960s, the Exner Comprehensive Rorschach System used today (the 1987 updated version) is a computer-based scoring system that provides score summaries and lists likely personality and adjustment descriptions for each test taker. Specifically, this scoring system considers aspects of a test taker's response such as the content of the response, the reasons for the events present on the card, the location of events on the card, and elaboration on cooperative and aggressive behavior. Exner also recorded certain popular and common responses to the cards and the degree to which test takers chose these responses. It should be noted, however, that many examiners still interpret the scores without benefit of a computer. Test scores, whether based on Rorschach's original formulation, Exner's comprehensive scoring system, or other scoring systems, are based on several factors. One is location, or what part of the blot a person focuses on: the whole blot, sections of it, or only specific details within a particular section. Another is whether the response is based on factors such as form, color, movement, or shading. These factors are referred to as determinants. For example, people who tend to see movement in Rorschach blots are thought to be intellectual and introspective; those who see mostly stationary objects or patterns are described as practical and action-oriented. Finally, content refers to which objects, persons, or situations the person sees in the blot. Content categories include humans, animals, clothing, and nature. Most examiners also assess responses based on the frequency of certain responses as given by previous test takers. Many psychologists interpret the test freely according to their subjective impressions, including their impression of the subject's demeanor while taking the test (cooperative, anxious, defensive, etc.). Such interpretations, especially when combined with clinical observation and knowledge of a client's personal history, can help a therapist arrive at a more expansive, in-depth understanding of the client's personality. There have, however, been studies that support the validity of the Rorschach test. When trained psychologists use a comprehensive scoring system, agreement between administrators on certain variables ranges between 80% and 100%. Also, Exner's comprehensive system is based on a standardization sample of more than 2,000 children, adolescents, and adults. This sample included a large number of schizophrenic and depressed individuals. Exner, John E. The Rorschach—A Comprehensive System. Basic Foundations, Volume One. New York: John Wiley and Sons, 1993. Reynolds, Cecil R. Comprehensive Clinical Psychology. Volume 4: Assessment. Amsterdam: Elsevier, 1998. FYIThere have, however, been studies that support the validity of the Rorschach test. When trained psychologists use a comprehensive scoring system, agreement between administrators on certain variables ranges between 80% and 100%. Also, Exner's comprehensive system is based on a standardization sample of more than 2,000 children, adolescents, and adults. This sample included a large number of schizophrenic and depressed individuals.